Fall in love over a glass of this sweet and floral Rose Caipirinha. Scroll down for the recipe. Back when I was a student studying law in Nottingham, Jon took me out for a Brazilian themed date night one Valentines Day. The best thing about having moved from our small town in Hertfordshire to Nottingham was the food and drink scene and Jon knew that the best way to woo me was to take me to a restaurant followed by a cocktail bar. We stuffed ourselves silly and giggled all night long in a South American restaurant. We sipped caipirinhas and vowed to come back to try every variety they had on the menu. Unfortunately we never did go back to the restaurant (there were just too many good restaurants to try in the city). But, we did fall in love with caipirinhas and on Valentines Day the following year Jon bought me a bottle of ‘cachaça’ the key ingredient to any good caipirinha! Cachaça is a spirit made from sugarcane. 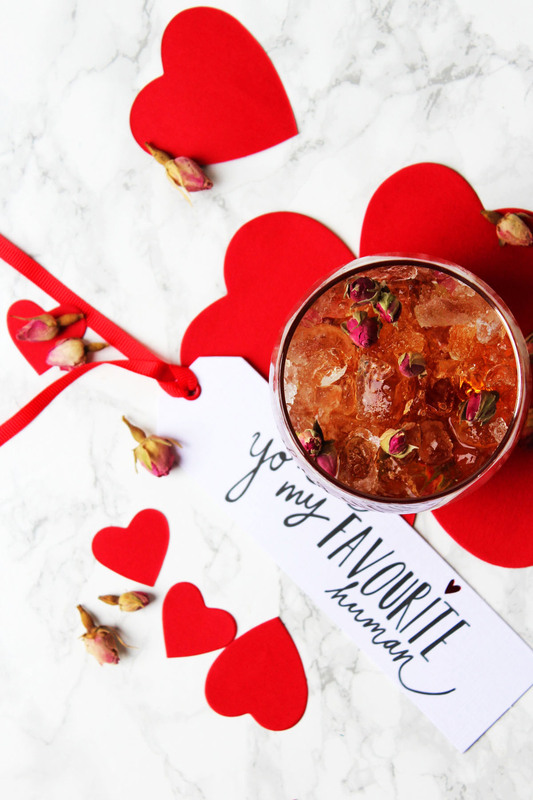 It’s strong but its sweet making it the perfect spirit for including in my Valentines cocktail – the Rose Caipirinha! If you can’t get your hands on cachaça you can replace it with any other white spirit (think vodka or white rum). Just add a spoon of sugar to take the harsh burn of the alcohol away. Cachaça can be as strong as 48% but the sweet flavour makes it way more drinkable than any other white spirit. This Valentines Day I wanted to remind Jon of that date night, long long ago and treat him to a caipirinha made just for him! Of course any Valentines cocktail has to include roses. So rather than muddling my cachaça with lime and sugar, I used two shots of rose syrup. A sweet, delicate, floral syrup made from the petals and fruits of the rose plant. You can buy rose or rose hip syrup in good super markets or failing that, the internet! Even Amazon sells it. 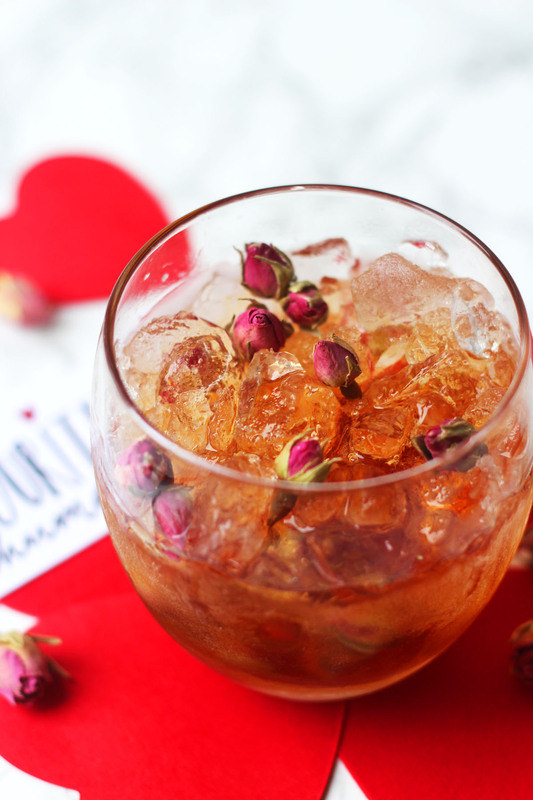 If you want to make this Valentines cocktail extra special then you could even make the rose syrup yourself! Fellow food blogger Choclette from Tin and Thyme shows you how on her blog. As well as using rose syrup I also muddle the cachaça with dried rose buds and petals. You can pick these up in loose leaf tea shops. 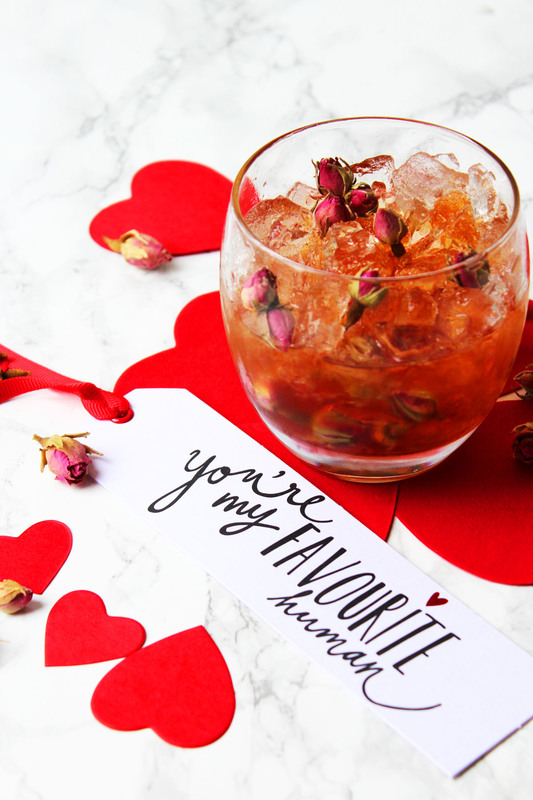 Once all the ingredients have been muddled together it’s as easy as pouring over some crushed ice and before you know it you have the perfect cocktail for celebrating Valentines Day with your loved one! Muddle together the lime, rose syrup cachaca and rosey petals/buds. Pour over crushed iced to serve. I’m not sure how Jon and I will be celebrating Valentines Day this year. It falling on a work night I doubt it will involve a meal out or copious amounts of Rose Caipirinha! Perhaps we’ll cook a special meal in instead. What are your plans for this Valentines Day? Let me know int he comments below. If you’re planning on treating your lover this Valentines Day, make sure you’ve pinned the recipe to come back to later. Enjoy! Thanks Helen. Glad you like it! What a lovely drink and also the story behind it. Happy Valentines! Anything rose flavoured is a winner for me. What a treat. Perfect for valentines. This is one of my favourite cocktails, but I love your twist on it. Perfect for Valentine’s Day! Cheers! This looks like my type of drink!! My husband has gotten into cocktail making lately so this would be a fun recipe to try for Valentine’s Day! I’ve never ever heard of Caipirinha before! But this is soooo darn pretty! I need it in my life! Why didn’t I see this before Valentine’s?! Ah well, any excuse for romance and a tasty drink, I shall give these a try! You can totally enjoy this any time of year 🙂 enjoy!